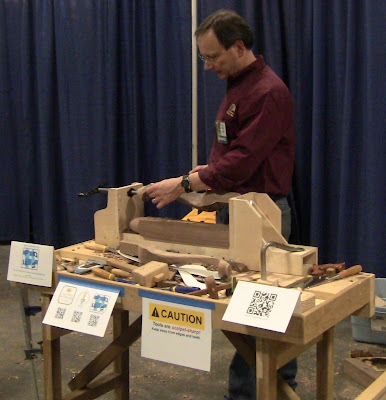 My portable bench setup at the WoodExpo, demonstrating making cabriole legs entirely with hand tools. Here I'm at work with a rasp on a nearly-finished leg, with another squared-up leg blank sitting on the carving vise, ready to be sawn out. Yesterday was the first day of Tommy Mac's WoodExpo 2012 at the New England Home Show. I was there in two capacities, first as an exhibitor in the furniture exhibition with my modest little Queen Anne foot stool, and second as a member of the Society of American Period Furniture Makers, demonstrating techniques for making period furniture alongside Mickey Callahan and Freddy Roman. I had my portable bench setup, along with various shop accoutrements. Other than one more box of tools, this was a complete portable hand tool workshop. My mother suggested I get a large backdrop made from the photos of my tool wall, so I can look like I'm in my home workshop. I'll have to do that for next time! Being a Thursday, it was relatively quiet, but I had a number of people stop to watch and talk; the weekend will get crazy. I invited everybody to try their hand at it. Some were reluctant, afraid they would ruin my work, but I assured them it would be fine. You can only remove so much stock at a time with a spokeshave! Others took the opportunity enthusiastically. The sign on the front of my bench. Several families stopped by, and I showed the kids how and guided their hands. One mother got a picture of her young son standing on my tool box shaving away, then asked if she could try. She got the hang of it pretty quickly and said, "Wow, this is a lot of fun!". They were both hooked. I always say there's nothing more satisfying than shaping a piece with a spokeshave. As people asked questions, in addition to the spokeshave, I gave several impromptu demos on the use of rasp and scraper, chisel sharpening, scraper sharpening, dovetail sawing exercises, and chopping half-blind dovetails. I also showed them how I sawed out the cabriole leg blanks with ripsaw and bowsaw. I always explain that one of my main points is to show that people can do this kind of work even if they don't have access to power tools, such as a bandsaw for sawing out the legs. Whether they are restricted by space, finances, or noise, hand tools allow them to do everything. Some operations may be a little more time consuming and laborious, such as ripping full boards, but many operations can actually be done faster once you've invested some time in developing the skills. I point out that you work on each skill individually rather than be overwhelmed by trying to master everything at once. You're training your brain and your body to develop overall eye-hand coordination and control, so improvement in one skill actually contributes to other skills bit by bit. It's like a musician who starts out squealing out notes that make you cringe, progressing through practice to make beautiful music. In addition to Tommy Mac's booth for the PBS show Rough Cut, there's a main bench setup for presentations to be filmed, plus the WoodExpo exhibitors; Chuck Bender has a full show booth setup. Al Breed will be presenting Sunday. Phil Lowe was scheduled to do a couple of presentations, but he unfortunately is out with the flu. Freddy Roman will be taking over one of his time slots. Guess who will fill the other one? This is probably the only time in life I will ever be the replacement for Phil Lowe. I'll be demonstrating how to resaw by hand. On behalf of SAPFM and all the WoodExpo participants, I'd like to thank Rich Castiglione, Show Director, for donating the space to allow us to do this. This is a great way to promote custom woodworking and furniture making. Unlike me, most of the participants are professionals earning a living this way, so it gives them a great opportunity to connect with potential customers and highlight the craft. Thanks also to Tommy for organizing it, and to Eli Cleveland, Justin DiPalma, and Scott Oja for running things. This is Tommy's fifth year here.